Contract failure is an issue among home buyers. Lenders want 10 documents from borrowers. Where to find great mortgage rates. Top 10 Items Lenders Want From a Home Buyer. In late January 2012, the National Association of Realtors (NAR) reported that the index of pending home sales dropped in December 2011 3.5% in December following a 7.3% surge in November. Home sales numbers have ridden a bumpy road road for the past 3 years, so the drop itself was not newsworthy. What captured the attention of Bills.com was the quote attributed to NAR's Lawrence Yun, "Contract failures remain an issue, reported by one-third of Realtors over the past few months..." Yun is NAR's chief economist. "Contract failure" is the NAR's term for a pre-approved borrower under contract to buy a house not being funded by the lender. Let us look at why a home loan application might fail. Can this borrower repay the loan? Will this borrower repay the loan? Ability to repay a mortgage is verified by the borrower's current employment, total income, and amount of other debts. Lenders prefer a borrower to be employed at the same place for at least two years, or to have been in the same line of work for a few years. The lender weighs the borrower's existing debt load, too. The borrower's willingness to repay is determined in two ways. First, the lender looks at how the borrower plans to use the property. Owner-occupied properties default at a lower rate than investment and vacation properties. Second, willingness to repay is closely related to the borrower's history of repaying loans. The borrower's credit report and history of repaying rent and utility bills comes into play here. Every bit of information the lender asks from the borrower helps the lender answer the ability and willingness to repay questions. Proof of legal U.S. residency (for FHA, Freddie Mac, and Fannie Mae only). Pay stubs, W2 withholding forms, or other proof of employment and income verification. Tax returns for two years. Any gift letters, if you are using a gift from a parent, relative or organization to help cover the down payment and/or closing costs. This letter simply states the money is a gift and will not have to be repaid. Your debt-to-income (DTI) ratio. Information on other consumer debt, such as car loans, furniture loans, student loans and retail/credit cards. Lenders calculate and analyze your DTI ratio to determine the size mortgage you can afford. Lenders look for a DTI ratio of 35% or less. See the Bills.com article DTI: Debt-to-Income Ratio to learn how to calculate your debt-to-income ratio. If you have each of these 10 items in hand, move on to see how much mortgage you can afford. The three key elements to a loan are the amount, the length of the loan, and the interest rate. In home loans, interest can be fixed over the entire length of the loan, or adjustable. Adjustable rate loans today are lower than fixed-rate loans, but carry the risk of shooting up when the financial markets change in the future. However, if you plan to own the home for less than the length of the loan, or believe rates will stay low, then an adjustable-rate loan is right for you. Many homeowners like the security of knowing their loan payments will not change, and choose a fixed-rate loan. 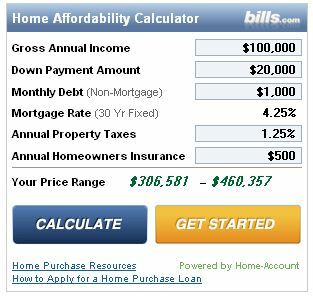 See the Bills.com resource Mortgage Rates to learn today's fixed and adjustable interest rates. Great tips, thanks Bills team!